Christian communities flourished during late antiquity in a Zoroastrian political system, known as the Iranian Empire, that integrated culturally and geographically disparate territories from Arabia to Afghanistan into its institutions and networks. Whereas previous studies have regarded Christians as marginal, insular, and often persecuted participants in this empire, Richard Payne demonstrates their integration into elite networks, adoption of Iranian political practices and imaginaries, and participation in imperial institutions. 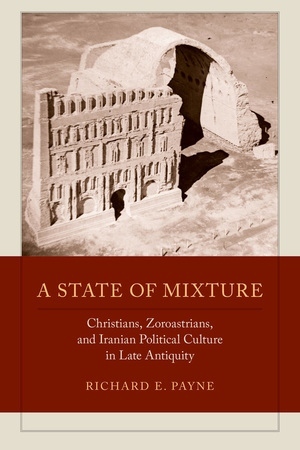 The rise of Christianity in Iran depended on the Zoroastrian theory and practice of hierarchical, differentiated inclusion, according to which Christians, Jews, and others occupied legitimate places in Iranian political culture in positions subordinate to the imperial religion. Christians, for their part, positioned themselves in a political culture not of their own making, with recourse to their own ideological and institutional resources, ranging from the writing of saints’ lives to the judicial arbitration of bishops. In placing the social history of East Syrian Christians at the center of the Iranian imperial story, A State of Mixture helps explain the endurance of a culturally diverse empire across four centuries. Richard E. Payne is Neubauer Family Assistant Professor of Ancient Near Eastern History at the University of Chicago.